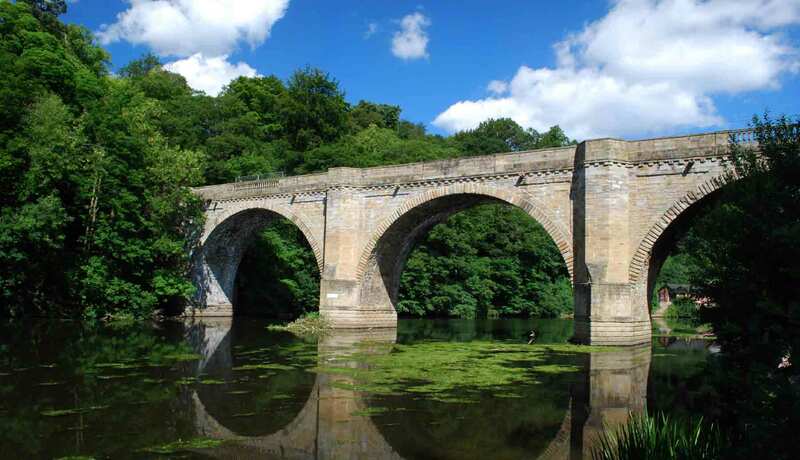 My reflections on the effects of the heatwave on freshwater algae continued with the latest of my regular visits to the River Wear at Wolsingham. A comparison of the picture above with that at the head of “Spring comes slowly up this way …” says it all: the sun was shining and the gravel berms that I usually use to enter the river were occupied by families with barbeques whilst their children splashed around in the water. At times such as this, a grown man picking up stones and then vigorously brushing their tops with a toothbrush would have invited too many questions, so I slunk off 100 metres or so downstream and found a quieter spot to explore. The biofilm in the main channel of the River Wear at Wolsingham, July 2018. The first thing I noticed was that the biofilm coating the submerged stones at the bottom of the river had a greenish tinge, rather than its usual chocolate brown appearance. It also was more crusty and less slimy to the touch than I usually see in this river. When I got a specimen under the microscope, I could see that the composition was completely different to that which I had observed in previous months. Most samples from this location that I’ve looked at in the past have been dominated by diatoms, with occasional spring flourishes of filamentous green algae. Today, however, the sample was dominated by small green algae – a group that I am not very confident at identifying. My rough estimate is that these formed about three quarters of all the algae that I could see, with diatoms and cyanobacteria each accounting for about half of the remainder. The most abundant greens were a tiny single-celled alga that I tentatively identified as Keratococcus bicaudatus, along with a species of Scenedesmus and Desmodesmus communis. There were also a number of cells of Monoraphidium arcuatum and some of Ankistrodesmus sp. Two views of biofilms from the River Wear, Wolsingham in January 2018. Left: from the main channel; right: from pools at the edge of the channel. Green algae from the River Wear at Wolsingham, July 2018: a. Desmodesmus communis; b. Monoraphidium arcuatum; c. Scenedesmus sp. ; d. unidentified, possibly Keratococcus bicaudatus. Scale bar: 10 micrometres (= 1/100th of a millimetre). However, there were also pools at the side of the channel, away from the main current but not so cut off that they were isolated from the river itself. These were dominated by dense, brown filamentous growths, very similar in appearance to the Melosira varians flocs I described in “Some like it hot …”. The filaments, however, felt coarser to the touch and, in close-up, could be seen to be branched, even without recourse to a microscope. 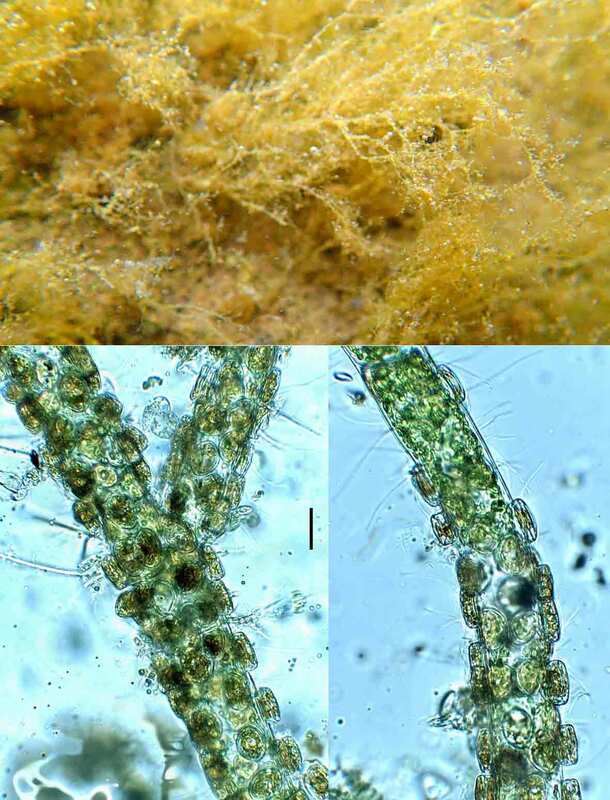 Once I got these under the microscope, I could see that they were filaments of Cladophora glomerata, another green alga, but so smothered with epiphytic diatoms (mostly Cocconeis pediculus) that they appeared brown in colour. This combination of Cladophora glomerata and Cocconeis pediculus in the backwaters were as much of a surprise as the green-algae-dominated biofilms in the main channel. These are species usually associated with enriched rivers (see “Cladophora and friends”) and, whilst I have seen Cladophora in the upper Wear before, it is an unusual occurrence. Just as for the prolific growths of Melosira varians described in “Some like it hot …” it is tempting to leap to the conclusion that this must be a sign that the river is nutrient-rich. However, the same conditions will apply here as there: “nutrients” are not the only resource that can limit plant growth and a steady trickle of phosphorus combined with warm, sunny conditions is just as likely to lead to prolific growths as a more conventionally “polluted” river. Cladophora filaments smothered by the diatom Cocconeis pediculus in a pool beside the River Wear at Wolsingham, July 2017. The frame width of the upper image is about 1 cm; the scale bar on the lower images is 20 micrometres (= 1/50th of a millimetre). Another way to think of these situations is that, just as even healthy people are occasionally ill, so healthy streams can go through short periods when, based on a quick examination of plants and animals present, they exhibit symptoms associated with polluted conditions or simply (as for the first sample I described) different to what we usually expect to find. A pulse of pollution might have passed downstream or, as seems to be happening at the moment, an unusual set of conditions lad to different organisms thriving. Just as the ability to fight off infection forms part of a doctor’s understanding of “health”, so I expect that the River Wear will, in a few weeks time, be back to its usual state. Healthy ecosystems, just like healthy humans, show “resilience”. The irony is that, in this case, the “symptoms” are most obvious at a time when we are enjoying a summer better than any we’ve had in recent years. The view above – looking along Ennerdale Water from the western end – is one that I’ve used before in this blog. The difference today is that there is about twenty metres of foreshore exposed. Normally, water covers all the area in the foreground. 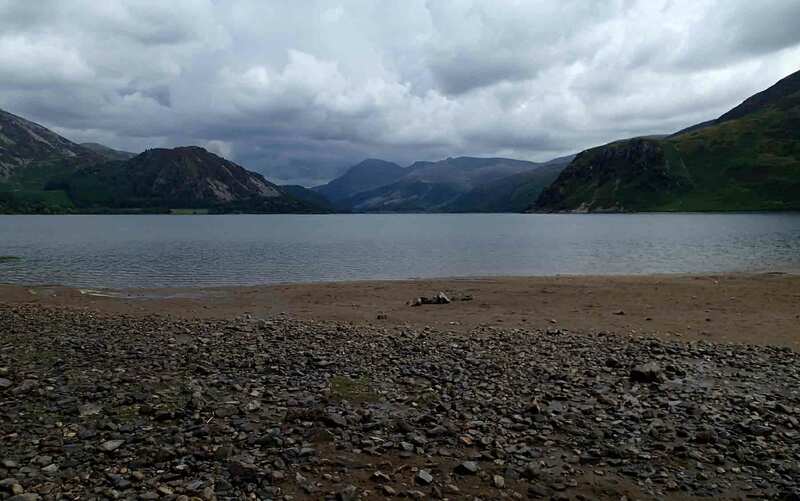 Not today: Ennerdale Water is one more victim of our present drought conditions. During the winter, we often see water splashing over the weir at the outfall; today, the weir head is a metre above the lake level and flow in the River Ehen is maintained only by pumps installed by United Utilities. When W.H. Pearsall visited Ennerdale Water in the 1920s, he considered it to be one of the most primitive of the Lake District’s lakes (see “The power of rock …”). However, this supposedly wild lake had been tamed by a weir since the middle of the 19th century in order to provide drinking water for Whitehaven and Workington and surrounding areas. That, in turn, has consequences for the river downstream, especially at times such as this when, unless augmented by pumps, there would be no water in the River Ehen below the outfall. 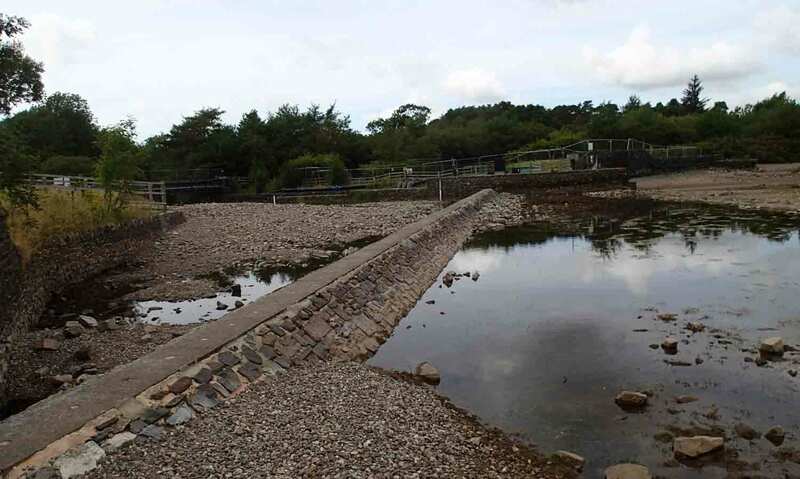 At some point in the next decade, a new water infrastructure project will pipe water to west Cumbria from Thirlmere, after which the weir can be removed and fluctuations in water level in both lake and river will be more natural. The weir at the outfall of Ennerdale Water, with the fish pass at the far end. Meanwhile, however, I was able to explore areas of the lake littoral zone that would normally be hidden from me. My notebook, for example, records my observations that this part of the lake shore has a stony bottom yet, as can be seen from the picture above, these form a belt about 20 metres wide, after which there is firm sand. Normally, this would be close to the limit of safe wading but, today, I could walk out with just a pair of thin neoprene shoes. Looking down, I could see a number of tufts of the alga Nitella flexilis growing in this sand. I’ve written about this species before (see “Finding the missing link in plant evolution …”) and have seen it in the lake before, but not in this particular location. Standing with the lake water lapping against my shins I could bend down and take some photographs of these with my underwater camera that give this usually chilly location a semi-tropical feel. It is a useful reminder to those of us who dabble in lake littoral zones and think that we understand their ecology that a lot happens beyond the depth in which we can safely wade. Marco Cantonati and colleagues, for example, have found big changes in the composition of the algal flora of Alpine lakes when they used Scuba diving to explore the depths of their littoral zones. No doubt, we would see similar changes if we were to try the same in the Lake District. Cantonati, M., Scola, S., Angeli, N., Guella, G. & Frassanito, R. (2009). Environmental controls of epilithic diatom depth-distribution in an oligotrophic lake characterized by marked water-level fluctuations. European Journal of Phycology 44: 15-29. Cantonati, M. & Lowe, R.L. (2014). 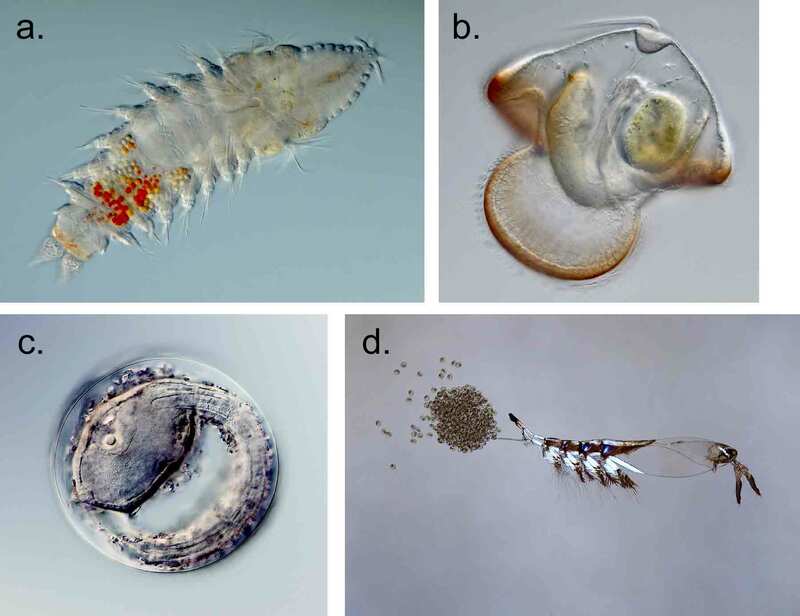 Lake benthic algae: toward an understanding of their ecology. Freshwater Science 33: 475-486. My reflections on algae that thrive in hot weather continued recently when I visited a river in another part of the country. As this is the subject of an ongoing investigation, I’ll have to be rather vague about where in the country this river flows; suffice it to say it is in one of those parts of the country where the sun was shining and your correspondent returned from a day in the field with browner (okay, redder) arms than when he started. Does that narrow it down? A feature of some of the tributaries, in particular, was brown, filamentous growths which, in close up, could be seen to be speckled with bubbles of oxygen: a sure sign that they were busy photosynthesising. These were most abundant in well-lit situations at the edges of streams, away from the main flow. Under the microscope, I could see that these were dominated by the diatom Melosira varians, but there were also several filaments of the cyanobacterium Oscillatoria limosa, chains of the diatom Fragilaria cf capucina and several other green algae and diatoms present. 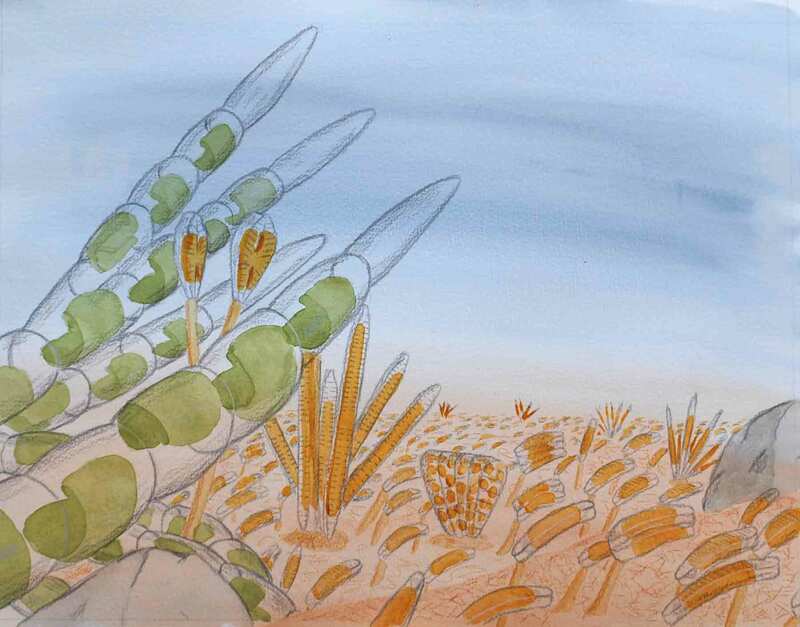 Melosira varians is relatively unusual as it is a diatom that can be recognised with the naked eye – the fragile filaments are very characteristic as is its habitat – well lit, low-flow conditions seem to suit it well. It does seem to prefer nutrient-rich conditions (see “Fertile speculations …”) but it can crop up when nutrient concentrations are quite low, so long as the other habitat requirements are right for it. 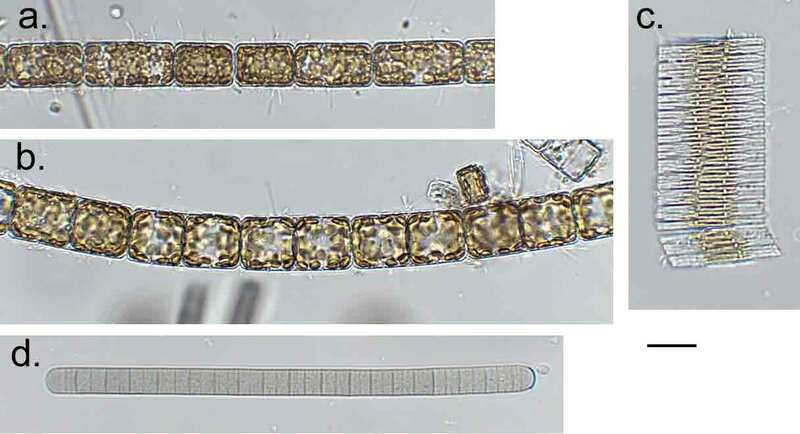 The long chains of Melosira (and some other diatoms such as Fragilaria capucina and Diatoma vulgare) help the cells to become entangled with the other algae. I could see this at some sites where the Melosira seemed to grow around a green alga that had been completely smothered by diatoms and was, I presume, withering and dying. In other cases, the Melosira filaments are much finer and seem to attach directly to the rocks. Neither arrangement is robust enough for Melosira to resist any more than a gentle current which is why it is often most obvious at the edges of streams and in backwaters. As is the case for Ulva flexuosa, described in the previous post, I suspect that the first decent rainfall will flush most of this growth downstream. Another parallel with Ulva is that, despite this apparent lack of adaptation to the harsh running water environment, Melosira varians is more common in rivers and streams than it is in lakes. Melosira varians-dominated filaments at the margins of a stream. 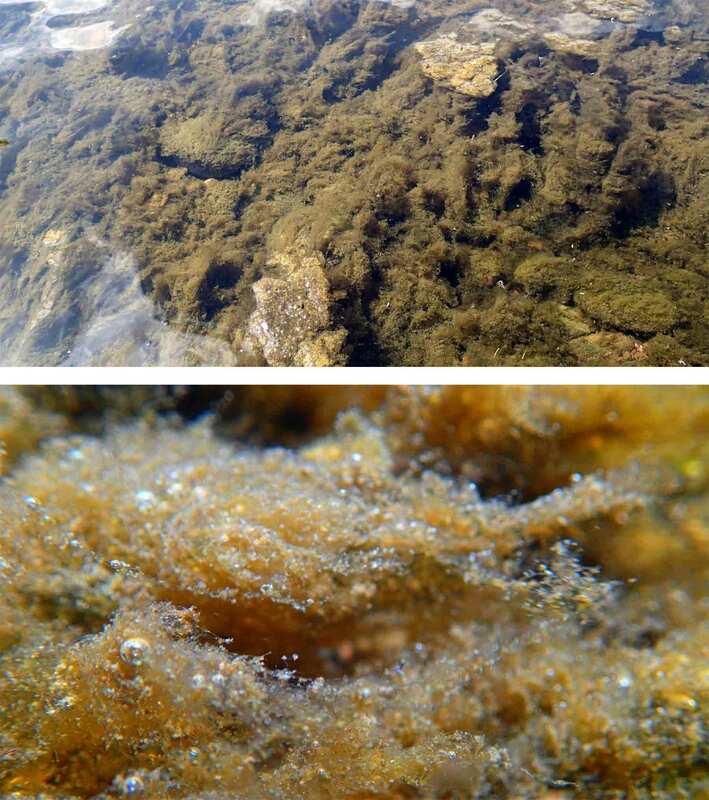 Top photograph shows the filaments smothering cobbles and pebbles in the stream margins (frame width: approximately one metre); bottom photograph shows a close-up (taken underwater) of filaments with oxygen bubbles (frame width: approximately one centimetre). 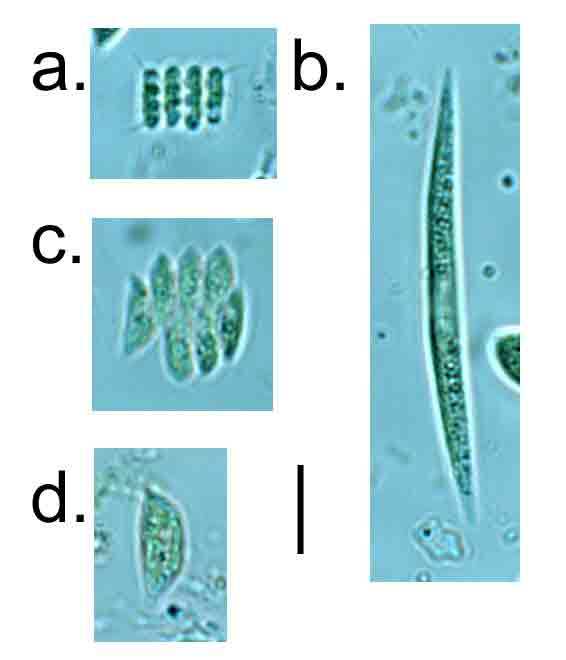 Algae from the filaments illustrated above: a. and b.: Melosira varians; c. Fragilaria cf capucina; d. Oscillatoria limosa. 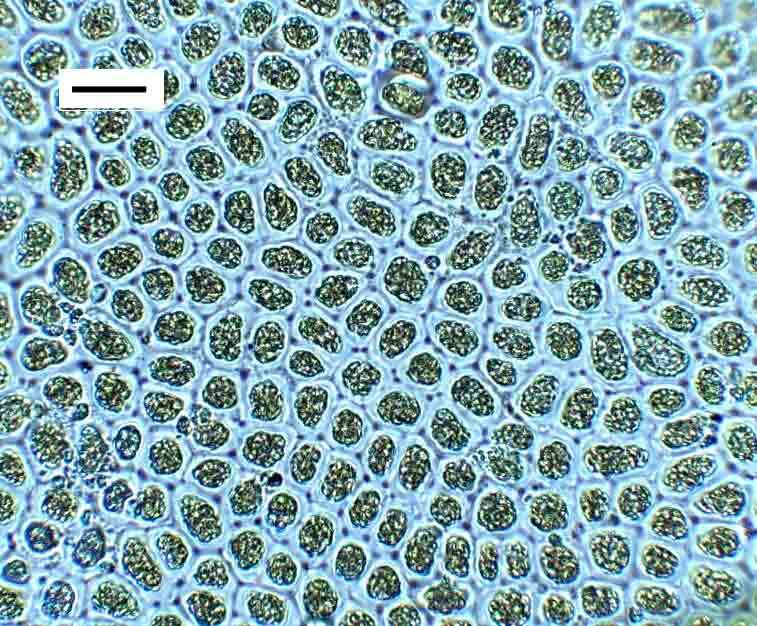 Scale bar: 20 micrometres (= 1/50th of a millimetre). The graphs below support my comments about Melosira varians preferring nutrient rich conditions to some extent. Many of our records are from locations that have relatively high nutrient concentrations; however, there are also a number of samples where M. varians is abundant despite lower nutrient concentrations. How do we explain this? About twenty years ago, Barry Biggs, Jan Stevenson and Rex Lowe envisaged the niche of freshwater algae in terms of two primary factors: disturbance and resources. “Resources” encompasses everything that the organism needs to grow, particularly nutrients and light, whilst “disturbance” covers the factors such as grazing and scour that can remove biomass. They used this framework to describe successions of algae, from the first cells colonising a bare stone through to a thick biofilm. As the biofilm gets thicker, so the cells on the stone get denser and, gradually, they start to compete with each other for light, leading to shifts in composition favouring species adapted to growing above their rivals (see “Change is the only constant …”). The relationship between Melosira varians and nitrate-nitrogen (left: “NO3-N”) and dissolved phosphorus (right: “PO4-P”). The vertical lines show the average positions of concentrations likely to support high (red), good (green), moderate (orange) and poor (red) ecological status (see note at end of post for a more detailed explanation). They suggested that filamentous green algae were one group well adapted to the later stages of these successions but these, in turn, create additional opportunities for diatoms such as M. varians which can become entangled amongst these filaments and access more light whilst being less likely to being washed away. If there is a period without disturbance then the Melosira can overwhelm these green algal filaments. Nutrients, in this particular case, do play a role but, in this case, are probably secondary to other factors such as low disturbance and high light. Using the terminology I set out in “What does it all mean?”, I would place M. varians in the very broad group “b”, with the caveat that the actual nutrient threshold below which Melosira cannot survive in streams is probably relatively low. Remember that phosphorus, the nutrient that usually limits growth in freshwater, comprises well under one per cent of total biomass, so a milligram of phosphorus could easily be converted to 100 milligrams of biomass in a warm, stable, well-lit backwater. Schematic diagram showing the approximate position of Melosira varians on Biggs et al.’s conceptual habitat matrix. 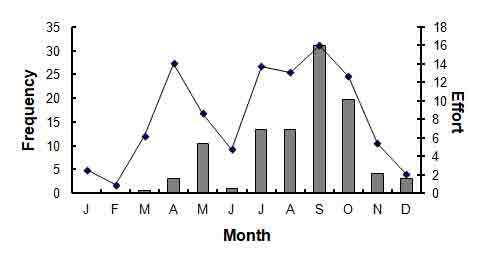 The final graph shows samples in my dataset where Melosira varians was particularly abundant and this broadly supports all that has gone before: Melosira is strongly associated with late summer and early autumn, when the weather provides warm, well-lit conditions with relatively few spates. The case of Meloisra varians is probably a good example of the problem I outlined in “Eutrophic or euphytic?” I have seen similar growths of diatoms in other rivers recently, due to the prolonged period of warm, dry conditions. It is easy to jump to the conclusion that these rivers have a nutrient problem. They might have, but we also need to consider other possibilities. Like Ulva flexuosa in the previous post, Melosira varians is an alga that is enjoying the heatwave. 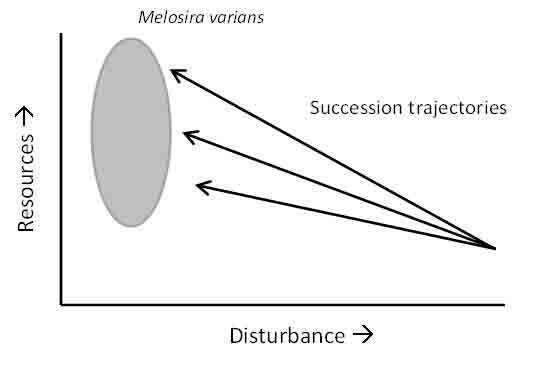 Distribution of Melosira varians by season. The line represents sampling effort (percent of all samples in the dataset) and vertical bars represent samples where M. varians forms >7% of all diatoms (90th percentile of samples, ranked by relative abundance). These are based on interrogation of a database of 6500 river samples collected as part of DARES project. Phosphorus standards are based on the Environment Agency’s standard measure, which is unfiltered molybdate reactive phosphorus. This approximates to “soluble reactive phosphorus” or “orthophosphate-phosphorus” in most circumstances but the reagents will react with phosphorus attached to particles that would have been removed by membrane filtration. The current UK phosphorus standards for rivers that are used here are site specific, using altitude and alkalinity as predictors. This means that a range of thresholds applies, depending upon the geological preferences of the species in question. The plots here show boundaries based on the average alkalinity (50 mg L-1 CaCO3) and altitude (75 m) in the whole dataset. 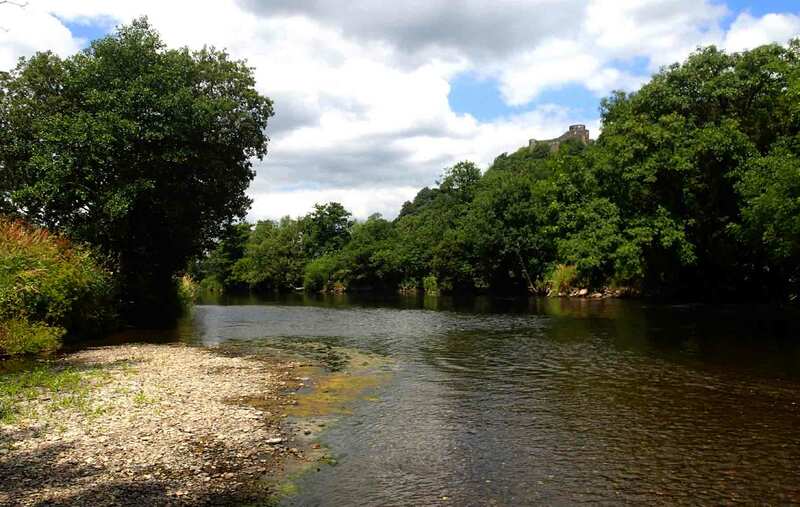 There are no UK standards for nitrate-nitrogen in rivers; thresholds in this report are based on values derived using the same principles as those used to derive the phosphrus standards and give an indication of the tolerance of the species to elevated nitrogen concentrations. However, they have no regulatory significance. It is a long time since we have had a heatwave in the UK that has lasted as long as the present one. The last that compares was in 1995, when the A1 near my house was busy with tankers ferrying water from Kielder Water in Northumberland to the drought-afflicted areas of Yorkshire. Three weeks in and gardeners are staring anxiously at the parched soil and quietly praying for rain whilst, at the same time, trying to make the most of the rare luxury of warm weather. Rivers, too, are showing the effects of the weather. In some parts of the country, rivers are drying out and fish stocks are threatened. That is not the case here in the north-east, but the River Wear is showing some signs. We often see a little Ulva flexuosa in the Wear during the summer, but rarely as much as this. 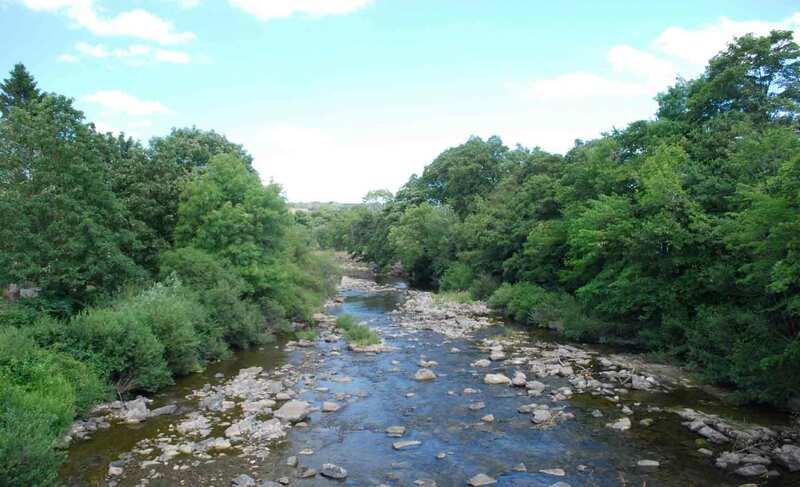 It is a species that thrives under still, warm conditions and which also benefits from the weirs which regulate the flow of the river in Durham. 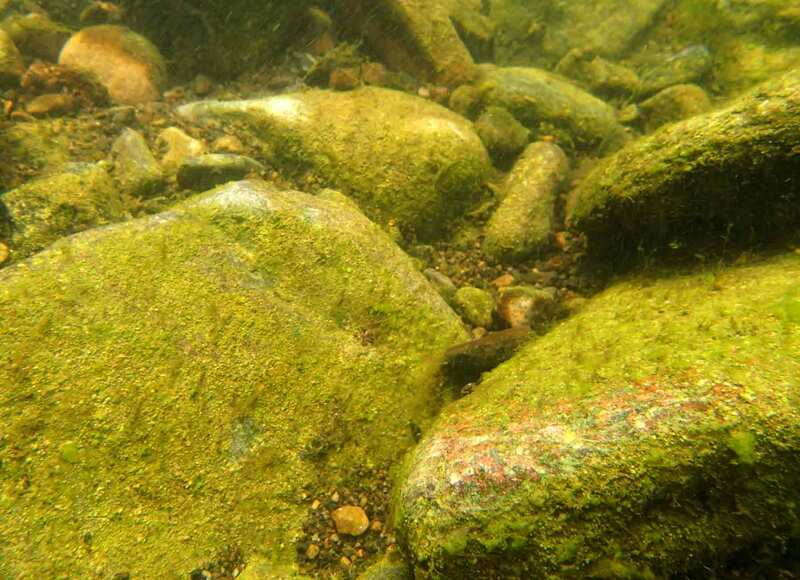 It is an alga that we tend to associate with nutrient-rich conditions, but this might be because the type of slow-flowing lowland rivers where it can become common are more likely to be nutrient rich than faster-flowing upland rivers where it is rarely found. The current weather, in other words, creates the “perfect storm” for Ulva flexuosa. Ironically, a storm – perfect or otherwise – will probably alter the flow regime in the Wear enough to flush it all downstream. Another curiosity is that, despite being favoured by low flows and the near-standing water behind the weirs in Durham, Ulva flexuosa seems to be more likely to form mass growths in rivers rather than in lakes or ponds. 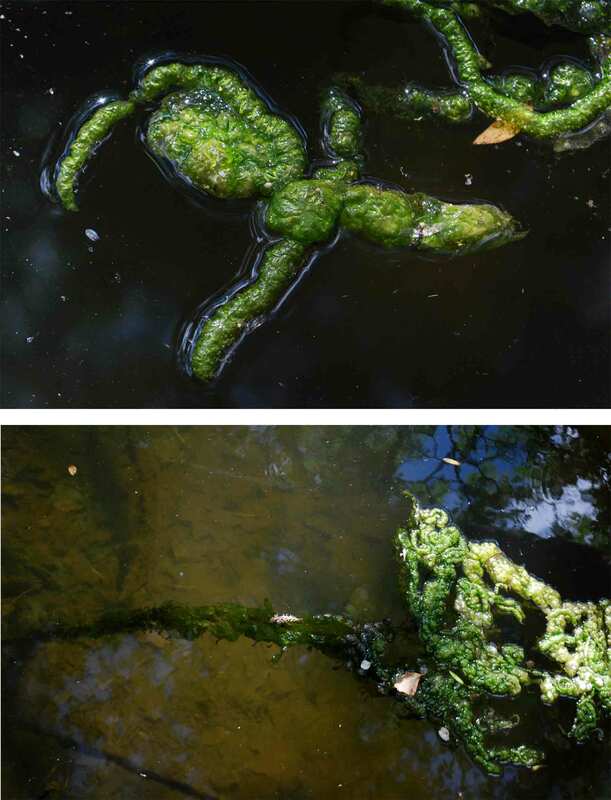 Ulva flexuosa in the River Wear, July 2018: the upper picture shows free-floating thalli, inflated by oxygen released by photosynthesis; the lower photograph shows thalli still attached to the river bed. In my experience, the genus Ulva tends to be absent from nutrient-poor conditions which is subtly different to saying that it thrives when nutrients are abundant. There are other factors – warm, stable conditions in particular that determine the success of the genus in any particular place. The Wear has seen a significant decrease in nutrients in recent years yet here we are, in 2018, with a river full of Ulva. I could say that, despite this reduction in nutrients, the Wear is still, relatively speaking, nutrient-rich, but the coincidence with an altered flow regime, a prolonged spell of warm weather and low flow conditions seems too great to ignore. 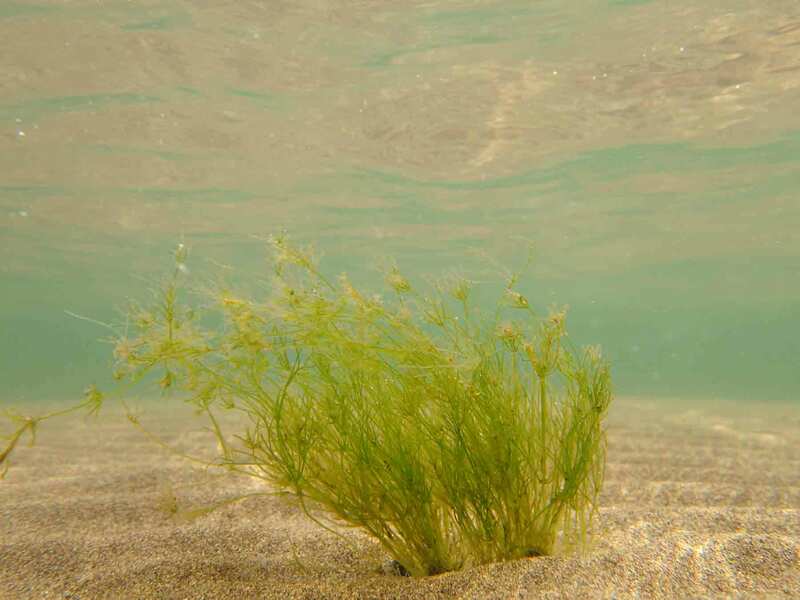 Ulva flexuosa is, in other words, a fine example of an alga where we need to think of a multifactorial “habitat template” rather than just in terms of single stressors. We also need to think in terms of probabilities of mass proliferations increasing or decreasing as habitat factors vary, rather than a simple likelihood of finding Ulva at any particular location. That means we need to look at climate change forecasts and, if there is a likelihood of more long, warm, dry summers, then we should expect more frequent blooms of Ulva in our rivers. We may tinker with nutrient concentrations and even try to restore more natural flows (though Durham’s rowers will have a view if that was tried here!) but, ultimately, Ulva flexuosa is a species that enjoys a heatwave as much as any other resident of these islands. A high magnification (x 400) view of the thallus of Ulva flexuosa from the River Wear. Scale bar: 20 micrometres (= 1/50th of a millimetre). The winner of the 2018 Hilda Canter-Lund competition for algal photography is Rafael Martín-Ledo for “Drifting diatoms”, his phase contrast image of a fragment of a colony of the diatom Licmophora, seen in a sample collected from the Bay of Santander, northern Spain, in March 2018. There are over twenty cells attached to this branched stem, each just over a 10th of a millimetre in length. The frond itself was probably originally attached to a seaweed in the littoral zone (see “epiphytes with epiphytes …”) but Rafael found it drifting in open water whilst using a plankton net. Rafael trained at the University of Extremadura in Spain and started his research career with Biodiversity and Ecology of Marine Invertebrates group at the University of Seville. 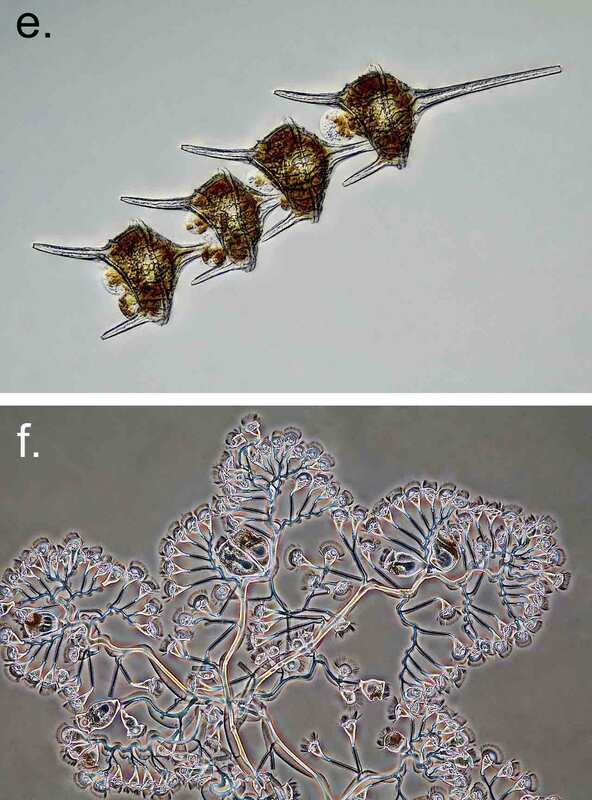 His primary focus during this period was the taxonomy, symbiosis and biogeography of the ophiuroids (echinoderms, including brittle stars) of Antarctic waters. After that he worked with the British Antarctic Survey in Cambridge, examining thousands of specimens from several expeditions. Rafael Martín-Ledo: 2018 Hilda Canter-Lund competition winner. He currently lives in Santander, working as an independent researcher with a particular interest in marine plankton. 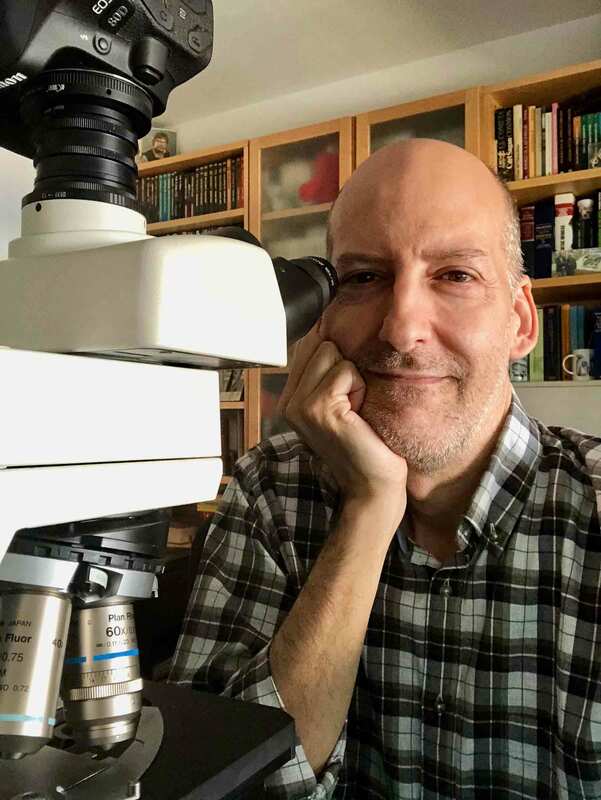 A personal project to document the larvae of planktonic invertebrates has led to the production of hundreds of images shared through a personal website, a YouTube channel (his videos of marine organisms are also of a very high quality) and a Twitter account (@rmartinledo). The primary motivation is taxonomic but a by-product of this is to make people aware of the great morphological beauty of lesser-known marine organisms. Some other examples of his work are reproduced below. d. Cymbasoma thompsonii, female with eggs (copepod). Polarization microscopy, 40x magnification. 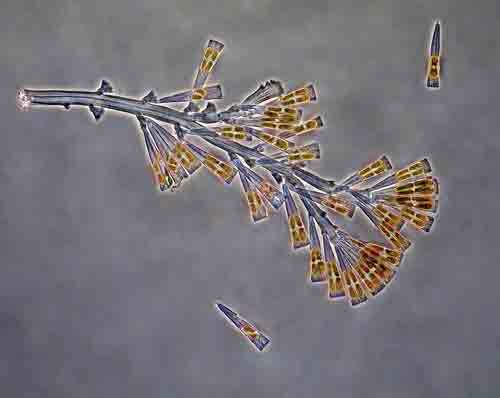 f. Zoothamnium pelagicum (colonial ciliate). Phase Contrast microscopy, 200x magnification. The second prize this year, awarded to the photographer of an image in a contrasting style, goes to John Huisman, an old friend of the competition who has been on the shortlist several times, winning in 2014. John is based in Perth, Western Australia and this photograph was taken during a trip to Ashmore Reef off the northern coast of Western Australia. His motivation is to document the marine flora of this remote region, and the image shows a new species from the red algal genus Ganonema. 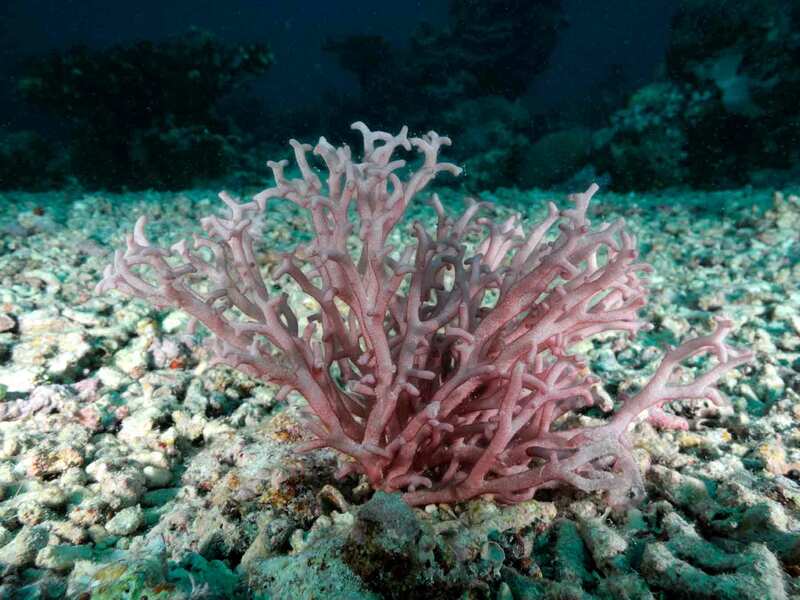 Ganonema is a genus of calcified, often mucilaginous red algae, the calcification occurring as granules in the cortex and not forming a firm skeleton. At Ashmore the new species was growing in coarse coral rubble at 12 metres depth. The photograph was taken while SCUBA diving, with a Nikon Coolpix P7100 in a housing with twin Inon strobes providing fill flash. 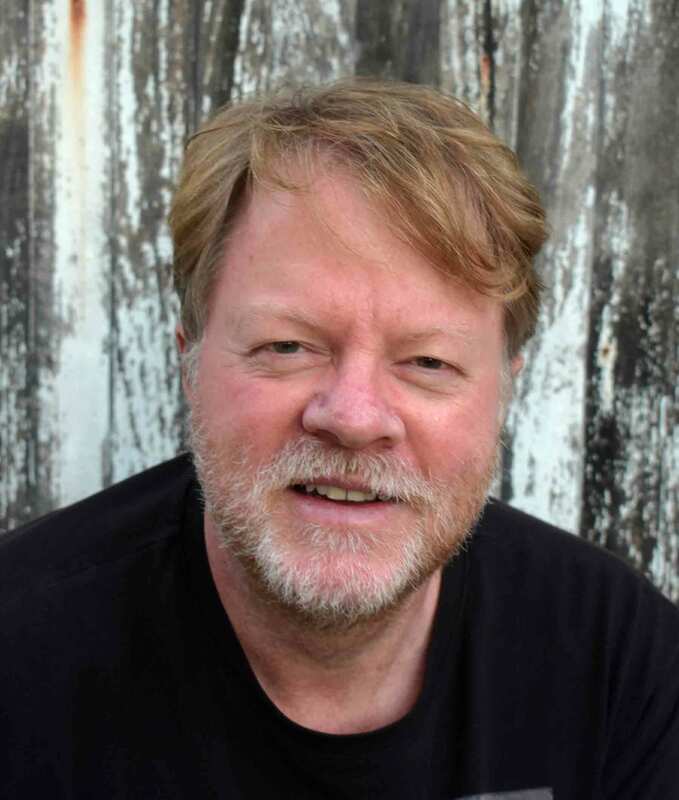 A new Ganonema: John Huisman’s prize-winning entry for the 2018 Hilda Canter-Lund competition. You can see these and all other winners and shortlisted images since the competition started in 2009 at the Hilda Canter-Lund pages of the British Phycological Society’s website.